Jilion, the company behind the cloud-based HTML5 video player SublimeVideo, is today announcing SublimeVideo Horizon, a new video application framework for video publishers and brands. This framework allows SublimeVideo’s customers to create their own player interface, with the colors, fonts, features and buttons they prefer, while also allowing them to integrate with popular sites like YouTube and Vimeo to host their videos. 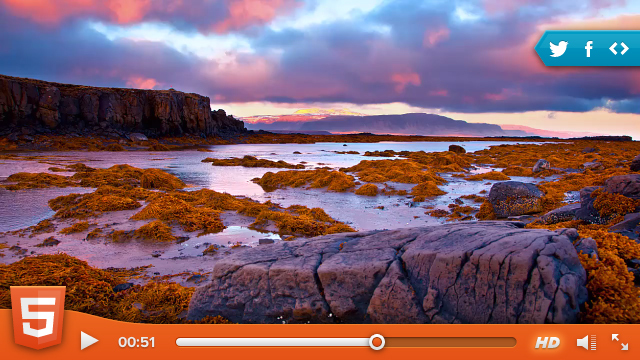 SublimeVideo, for those unfamiliar, has long been offering a plug-in free web player that uses HTML5 to display videos, with a “fall back to Flash” mode for older, unsupported browsers. The company commercially launched its product in March 2011, but later adopted a freemium model in November of last year, after struggling a bit to find the sweet spot in terms of pricing. Since going freemium, the company increased signups thirteen-fold. As of September 2012, Sublime Video says it was seeing 70 million pageviews per month (in terms of sites hosting its player), which is up from 4 million last December. Notable users include Sony Europe, Ralph Lauren, Ford, Qualcomm, Activision, NPR, Twit.tv, SchoolTube, Jingit, and others. Today’s launch of Horizon, which Jilion co-founder Zeno Crivelli says is the “biggest thing we’ve ever released since we showed the first SublimeVideo demo back in January 2010,” is meant to better serve Jilion’s paying customer base who want to brand their own video players on their site, but who still want take advantage of hosting on sites like YouTube, Vimeo or using their preferred hosting solution. With Horizon, Jilion is partnering with agencies to help publishers customize their player in nearly any way imaginable, not only choosing layouts, colors, logo and fonts, but also by offering ways to add interactive buttons to videos to engage users. For example, a band could add a “buy song” or “tour dates” button. A car company could add a “360 degree view” button right from within the video player itself. These modules can be built on demand per publisher requests, and can include any sort of additional interactive function the brand requires, whether that’s social sharing buttons, personalized information, e-commerce features linked to inventory levels, or anything else the publisher wants to showcase. YouTube, of course, offers ways to add interactivity to videos with annotations, but Jilion’s can be even more custom. According to Jilion co-founder Mehdi Aminian, this release puts SublimeVideo ahead of its competition. “It’s our most important release, by far, because, again, our cloud-player was nice and certainly the most reliable. However it has some alternatives like JW Player, VideoJS or MediaElement.js,” he says. “We knew it was also limited and not designed to receive new features easily. That’s why we decided to remain patient and to embark into the development of SublimeVideo Horizon, in order to have the very best technology on the planet to build any player you can imagine,” Aminian adds. The company has stayed lean, having only raised angel financing so far. With the launch of Horizon, Aminian says that the company will begin to pursue VC financing. In fact, the founders, usually based in Switzerland, are visiting the San Francisco Bay Area now, and are thinking of relocating. Today, Jilion is bringing Horizon to market and beginning to partner with agencies, but it is not yet making Horizon widely available to all developers at this time. An SDK for broader support will be forthcoming, but no ETA is available.